Pregnenolone has been shown to not only make people smarter but happier and enhance ones ability to perform tasks while heightening feelings of well-being. Pregnenolone has also been shown to reduce high stress induced fatigue. As is the case with the steroid-hormone precursor DHEA, pregnenolone levels decline with age. 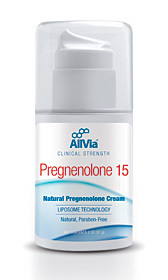 Many physicians and scientists believe that replacement of pregnenolone to youthful levels is an important step in the treatment of aging and symptoms of aging. Pregnenolone may be one of the most important hormones and may be able to bring levels of other hormones up or down as needed. The question that is being asked is why do we have such a significant decrease in Pregnenolone levels and is this normal? Some of thoughts why are levels decrease so drastically is that our bodies adrenals are overwhelmed from the stresses we put on them. Other studies are looking into out diet to find out whether we are not giving our bodies enough diverse food sources to make the building blocks/precursors to manufacture Pregnenolone. Do people in industrialized countries have lower Pregnenolone levels and therefore age prematurely and have aged related diseases earlier? Studies are showing this, communities where the work force is less taxed and the work is gratifying show higher levels of Pregnenolone which supports the studies that daily stresses overwhelm our adrenals and then for some reason they choose not to make Pregnenolone. "Maybe stress is the silent killer". Ideally it would be best to decrease stress, but in cases where this is not possible you may find that supplying the body with Pregnenolone you are able to deal with life much better physically and emotionally until life is more under control. Other benefits of pregnenolone may include stress reduction and increased resistance to effects of stress, improvement of mood and energy, reduced symptoms of menopause, improved immunity, and repair of myelin sheaths. These are signs of many of the end result of low pregnenolone, since it is a precursor to many of the hormones made from pregnenolone. Research on pregnenolone, as well as usage dates back as far as the 1930's. Human studies were conducted in the 1940's on factory workers to test the effect of pregnenolone on antifatigability, emotional well-being and autoimmune disorders, including rheumatoid arthritis. The results were successful and improvements were noted. Even though pregnenolone was proving to be not only effective, but safe as well, it was discarded when Merck pharmaceutical company's newly introduced pharmaceutical agent, cortisone, was announced to be a cure-all for rheumatoid arthritis in 1949. Soon after cortisone and cortisol came into use, the synthetic steroid hormones dexamethasone, and later prednisone, were introduced. Remember that these steroids are hundreds of times more powerful than pregnenolone (or Dhea for that matter). Because they could be patented, it was more politically and economically advantageous for pharmaceutical companies to promote these drugs rather than pregnenolone. Additionally, these steroids were very fast acting compared to pregnenolone. Users and doctors preferred the quick fix. However, these steroidal compounds proved to have serious downsides, including compromising the immune system and inducing osteoporosis, among other serious complications. Even though cortisone and cortisol are stress hormones that are natural to the body, they have historically been and continue to be administered in pharmacological doses rather than at physiological amounts natural to the body. The pharmacological levels at which cortisone and cortisol are generally administered give them a risk profile not unlike that of the synthetic hormones. Scientists have been studying the impact of hormones on learning and memory for many years. Various studies have found that pregnenolone enhances motivation, the ability to acquire knowledge, and long-term memory. A research group of industrial psychologists conducted studies to test pregnenolone on students and workers for the ability to enhance job performance. They found that the students/workers had a markedly improved ability to learn and remember difficult tasks. It is also amazing that pregnenolone not only enhanced job performance of the students/workers; but they additionally experienced heightened feelings of well-being. The same research group performed a study on factory workers to see if pregnenolone could improve their work productivity. Productivity increased most notably in the workers whose situations were considered the most stressful; for example, the workers who got paid per piece and whose living depended on their productivity. Improvement was noted, but less so, in workers who got paid a fixed wage regardless of their productivity levels. Not only did pregnenolone improve productivity for both groups, but the workers also reported enhanced mood. Rotate application of Pregnenolone between chest, inner arms and thighs. Apply one full press of the pump once a day for a maximum of 25 consecutive days. Resume after a five-day break. No known side effects when used as directed.